Recruiter Sales Training: Better Conversations. Better Results. Do your conversations with potential drivers abruptly die without reason? Are you tired of new drivers ghosting your application process? Do you need a higher conversion of leads to full applications? Do you need to convert more leads to hires? If you're like most, you’re nodding to all these questions. And believe us — we get it. Recruiting is harder than ever before! Register for this webinar now and learn how to have better sales-minded conversations. 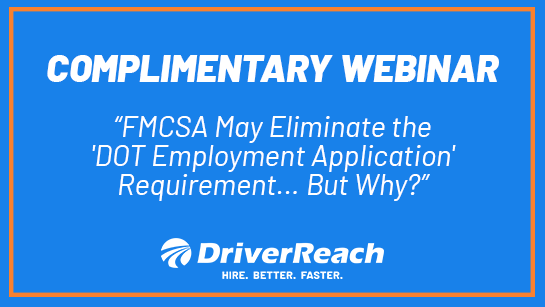 FMCSA May Eliminate the 'DOT Employment Application' Requirement... But Why? On March 8, 2019, the FMCSA published an advance notice of proposed rulemaking (ANPRM) concerning the long-standing requirement for prospective drivers to complete an employment application when applying for a driving job. This rulemaking action is another FMCSA step down the Trump Administration’s ‘regulatory reform and relief’ road, and it’s one that will likely have some trucking industry stakeholders scratching their heads wondering ‘why?’ Register now to find out. The demand for drivers is through the roof and competition is tougher than ever before. 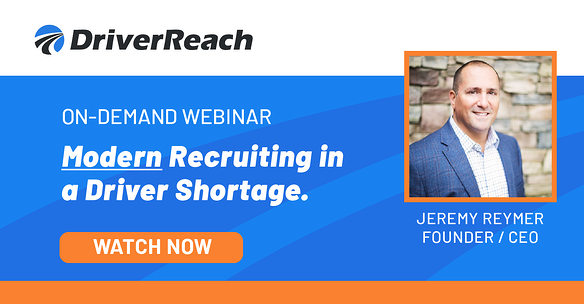 Thanks to the ongoing driver shortage, recruiting quality drivers can be an ongoing struggle. 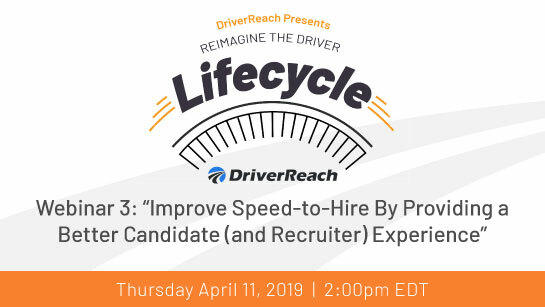 But as tough as the environment is, there’s an opportunity for your company to improve speed-to-hire by providing drivers with a better experience (and your recruiters, too!). 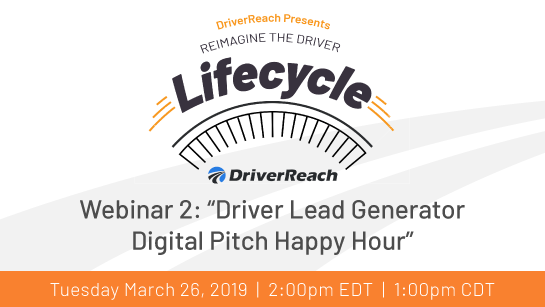 In this upcoming webinar, "Driver Lead Generator Digital Pitch Happy Hour", you don’t even need to leave the comfort of your desk! Just grab a cup of coffee and be prepared to take notes as you listen to top driver lead generators pitch their unique value propositions to you in an easy-to-follow, fast-paced setting. Recruiting drivers in today’s market is challenging, but carriers who are successful are the ones who are using innovative marketing strategies to reach drivers where they are. In this webinar, attendees will hear from Vice President of Marketing for Conversion Interactive Agency, Priscilla Peters, as she guides us through how to drive conversions from the top of the driver lead funnel all the way to the hire, implement strategies that differentiate your brand and your carrier from the driver’s perspective, and engage and prefer to communicate in today’s mobile world. Do your conversations with potential drivers abruptly stop without any reason? 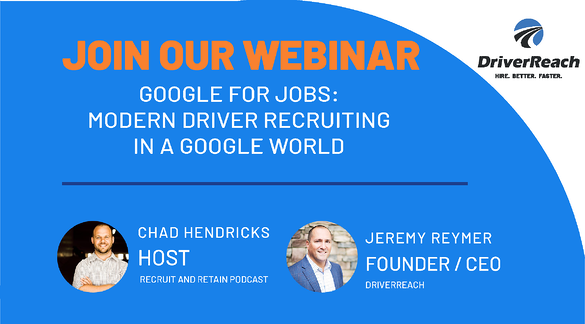 Are you tired of new drivers ghosting your application process? 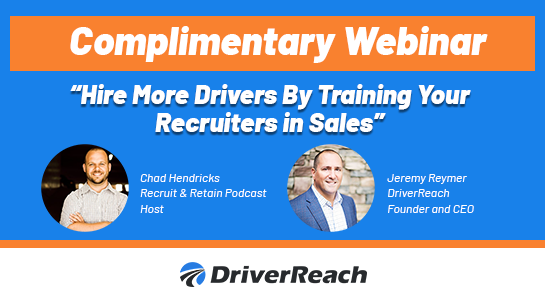 In this upcoming webinar, Recruit and Retain: Trucking Edition podcast host and Brand Outcomes Vice President Chad Hendricks will guide attendees through how to: get more drivers to fill out applications, entice potential hires to respond to your communications, feel confident that you can close the deal, and be part of the solution to the driver shortage. If you're barely surviving...dealing with high driver abandon rates, a cumbersome experience for the driver, or using archaic tools and you feel like you're spinning your wheels, then it's time to thrive! 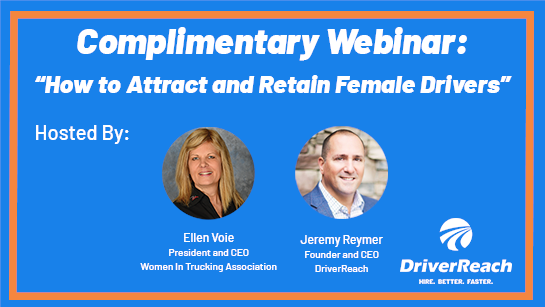 In this webinar, Women in Trucking Association (WiT) President Ellen Voie will discuss how CDL driver recruiters can target female applicants by crafting a women-driven message and changing the perception of the trucking industry in recruiting ads. 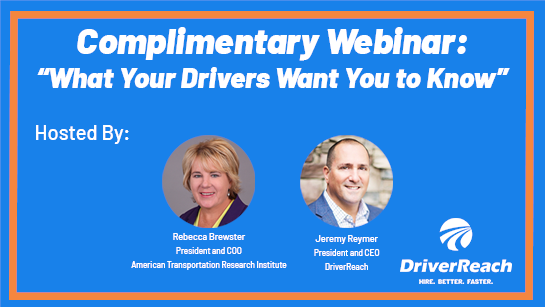 In this webinar, Rebecca Brewster, President and COO of ATRI, will describe those differences and help you understand not only what matters to your drivers, but where research is identifying solutions for those driver-specific challenges. Labor and employment law, and the risks associated with non-compliance, can be very costly. 'Ban the Box' laws are becoming more prevalent, and companies hiring CDL drivers are at risk if they aren't properly adhering to those laws. 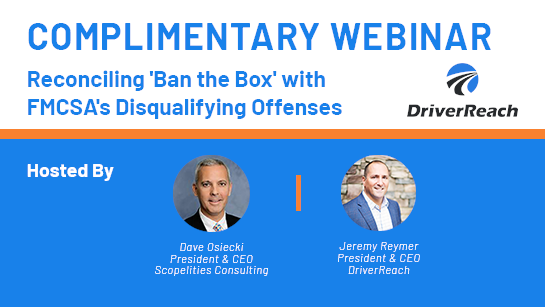 Join Dave Osiecki, President and CEO of Scopelitis Transportation Consulting LLC and Jeremy Reymer, Founder and CEO of DriverReach, as we discuss ‘ban-the-box’ laws, how they impact the hiring process, and the major "disqualifying offenses" the FMCSA is regulating. When it comes to the CDL driver recruiting funnel, most carriers miss the crucial points that occur between initial conversion and completion of full applications. 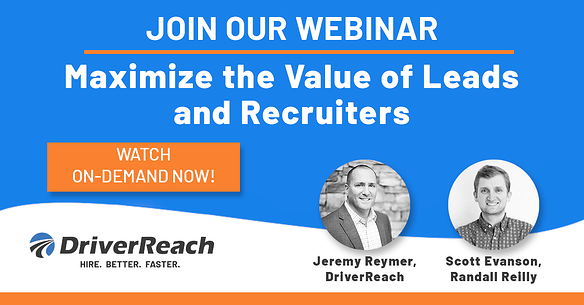 Learn the mechanisms you can put into place to decrease lead attrition and schedule more drivers for orientation. 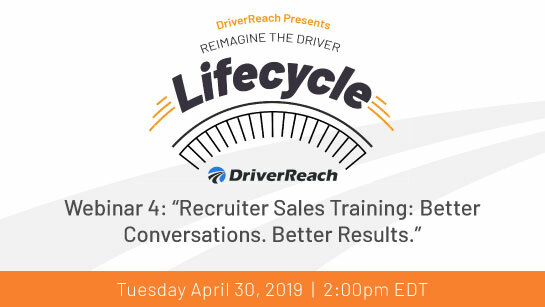 Join Scott Evanson, CEO of Smart Rhino Labs Division at Randall-Reilly, as he deep dives into how to keep your CDL driver applicants engaged throughout the entire application process. 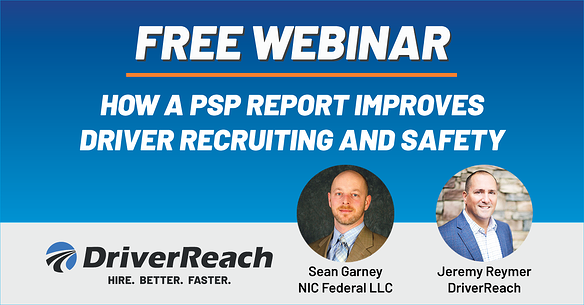 Listen to Sean Garney, Director of Business Development at NIC Federal LLC, the company that administers the PSP program on behalf of FMCSA, as he discusses how to best understand and use the information contained on a PSP report to improve driver recruiting and safety. With all of the new recruiting tools and solutions out there, it’s easy to get carried away with innovation, but let’s face it – we’re not developers. When it comes to building successful online recruiting solutions, the more ‘out-of-the-box’ the better. As an ATA Featured Product and member of ATA’s Workforce Development Committee, we’re dedicated to the future of the industry. 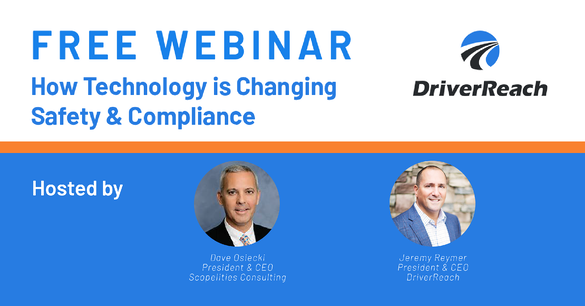 Join DriverReach's Founder and CEO, Jeremy Reymer, along with Dave Osiecki, President, and CEO at Scopelitis Transportation Consulting LLC, as we discuss how the FMCSA is adapting to technology that allows carriers to hire drivers faster and more efficiently.